I was recently spending some time in my little hometown of Birch Run, Michigan at my mom’s house when she started hammering me about her nutrition plan. So I stood up, went to her kitchen, and within one minute I was able to point out 4 things that were stopping her weight loss. 1: Plastics – Things like plastic containers leach PCBs into your food. 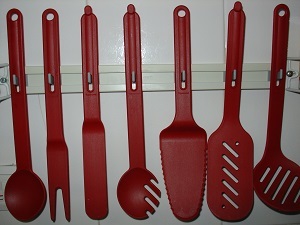 Plastic spatulas will melt into your food. And all those little tiny pieces missing from your plastic cutting board? Yup. They could be inside you right now wreaking havoc on your hormones, digestive system and blocking weight loss. plastic that gets into your food. Use glass containers, wood spatulas (I’m sure there are other alternatives too), and glass or wood cutting boards. And hand wash your plastic containers. When you put them in the dishwasher, the heat causes them to leach more. 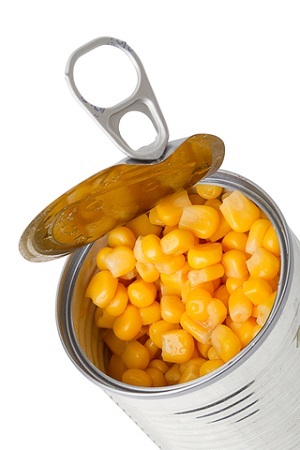 2: Canned foods – Almost all canned foods are loaded with BPA, which has been linked to all kinds of nasty side effects including raising bad estrogen inside the body which hinders weight loss. If you decide to use canned foods (NOT recommended), make sure they’re BPA free. 3: Highly processed oils like Canola and Vegetable oils – I’ve talked about this in several past newsletters. Both of these oils can convert to nasty trans fats when cooking with high heats. The best oils to use are coconut, grape seed, and real olive oil. 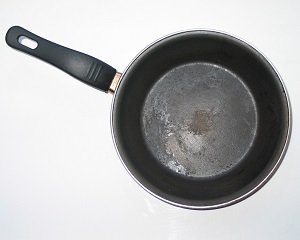 4: Teflon nonstick pans – Teflon (and aluminum) pans can leach chemicals into your body. Get Rid of non-stick pans! Try to buy and use stainless steel or enameled cast iron instead. I also told my mom to STOP microwaving fresh food. The very last thing I told my mom was to start using eco-friendly brands of cleaning supplies, shampoos, and soaps. I know she probably thinks I’m nuts, but I truly believe all of things are hindering her weight-loss goals. Hey, she asked! …Now you just have to make sure that you’re eating the #1 food of ALL TIME for weight-loss.